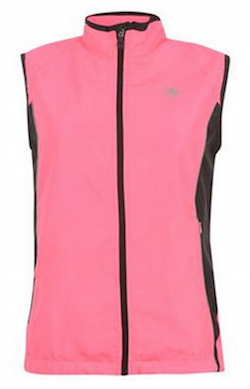 This high-vis running jacket and gilet was part of my high-vis splurge from Karrimor. In fact, I didn’t know the gilet was available, but I liked the running jacket so much that when I found it was, I decided to buy it separately. I bought a size 14 in all my Karrimor items, but the running jacket was a little snug on the hem when it arrived, so I opted for a 16 for the gilet. Of course, that’s now too big, but since it’s designed to go over other items, I’m OK with that. The fabric for these items is very lightweight. I think I had expected something sturdier, but while the weather was fine, it filled a gap between a simple tee and my heavier Mountain Warehouse jacket, and feels more breathable. I find both garments very attractive. The black side panels are very slimming and both items have handy zip side pockets. Both have black trim around the neck and cuffs, and black zips. The pink shows up well and was described as ‘cute’ by a friend who passed in a car. The pockets on both garments are very handy but the retroreflective areas are so tiny they might as well not be there. Overall, so far I am very pleased with my Karrimor products, though I certainly wouldn’t have paid full price for them. 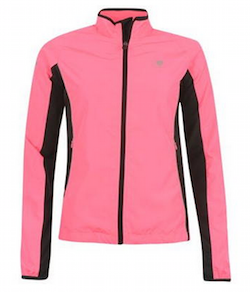 I got the running jacket for £11.99, down from £49.99, and the gilet for £8.99, reduced from £36.99. The garments are not worth the full price – they are kind of Asda quality. Quite quickly, the zip failed on the gilet, though I was able to reconnect it again, and I wouldn’t be surprised if these items didn’t last long. But at the sale price they are a bargain.